If you have had the pleasure of using an iPhone or any Apple Device, then you might be aware of the n number of issues it comes with. The charger dies faster than Usain Bolt runs, the audio jack appears and disappears, the amount of subordinate stuff you need to buy is insane. That being said, we love them. Apple tries to make all of their products proprietary and going to the apple store can cost you a lot. The hassle of googling things and trying a lot of programs eventually finding every program has a way of making you pay somehow. There are a ton of third-party services that have arisen because of this problem being pretty consistent. If you’re someone who doesn’t like wasting a lot of time googling things or are not very good at the art of googling or you’re just too busy and want a quick fix, then services like Joyoshare UltFix are the way to go. Today, we are going to be talking about exactly that service. If your iPhone is stuck in recovery mode, white logo screen, can’t turn on, etc. then in such situations, and effective iOS system recovery program is your best bet. 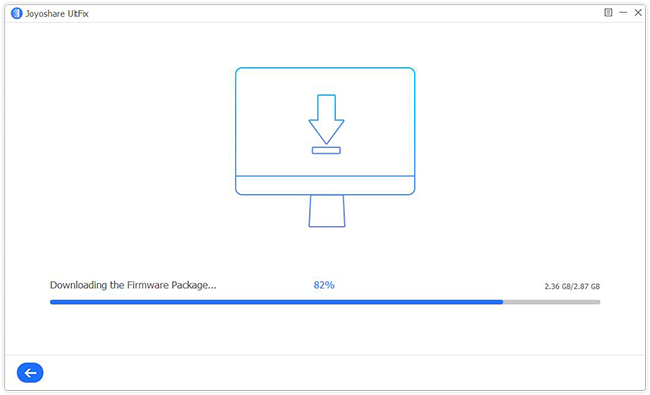 Joyoshare UltFix has some pretty great standards that it sets, it’s operational simplicity, high efficiency, full compatibility, and absolute safety makes it one of the best iOS recovery systems out there. Ideal for solving more than 30 kinds of iOS issues. Needs 3 simple steps to solve your problem. Has 2 modes: standard and advanced. One click entry/exit to recovery mode. Compatible with all versions of iOS up to the latest (12). Compatible with a series of iOS devices like iPhone, iPad, iPod touch, including iPhone XS/XR. Compatible with all systems including macOS 10.14, 10.13 High Sierra, 10.12 Sierra, 10.11, 10.10, 10.9, 10.8 and former. Do data loss or damage to your device. 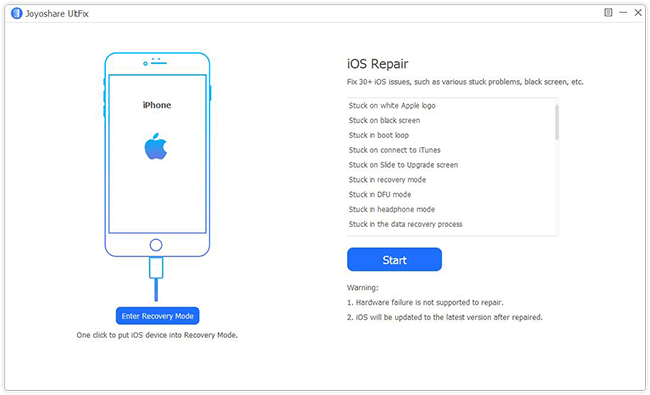 You can force restart your system, or reset it with iTunes but there is always the fear of data loss, but with this system, you can get your iPhone, iPad, iPod touch to normal with any data loss. This system is ideal for more than 30+ kinds of iOS issues in 3 simple steps including but limited to – iPhone not charging, iPhone update failed, iPhone black screen, iPhone is unable to connect to iTunes, spinning circle, iPhone in recovery mode, iPhone stuck in headphone mode, activation error, iPhone keeps turning off, frozen iPad, etc. The Joyoshare UltFix allows you to use 2 modes, which is standard mode and advanced mode. It is used to fix iOS problems without data loss or factory reset your device. It also offers you a free option that allows you to enter/exit recovery mode with one click, with no manual step-by-step operation. It is compatible with all the iOS versions up to the latest iOS 12, and is also compatible with a series of iOS devices which makes it a versatile tool for Apple users. 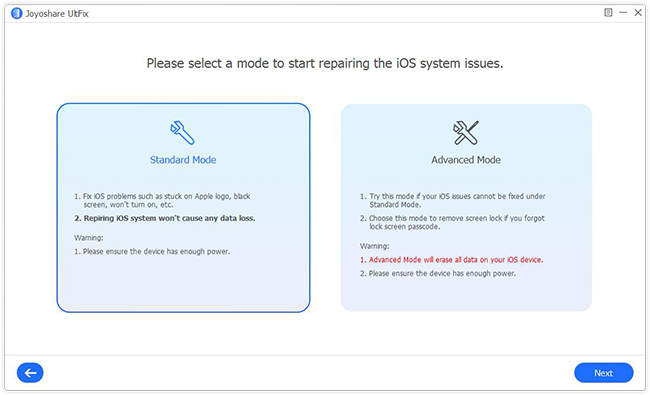 Most of the iOS problems can be repaired in basic mode, only a few serious system problems, like you forgetting the passcode to your device, needs to be done in advanced mode. It then restores your device to factory settings. Joyoshare UltFix iOS System Recovery is not only limited to registered users. It enables not only registered but also unregistered iOS users to enter and exit the recovery mode for free. 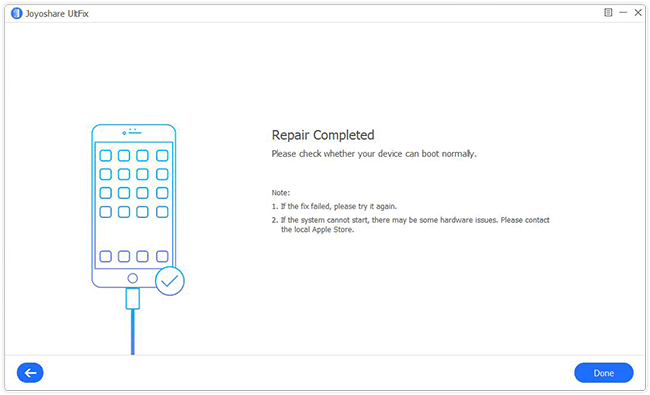 As mentioned before, with just one click, you can put your device into recovery mode automatically. Likewise, you do not need step-by-step operation to reboot your stuck iOS device and get it back to normal. It assists you to bypass iTunes errors, and the best part is that there is no data loss or damage to your device. Joyoshare UltFix iOS System Recovery is also reasonably priced at $39.95 for a licensed copy with lifetime free support and updates. If you are thinking of getting it for your office or business, then there are more license support types to suit your needs, including $49.95 for up to 5 Apple devices with free lifetime updates and support, and $69.95 for multi-user license which can be used for 6-10 devices. Honestly, not every one of us can actually follow all those labyrinth-like instructions to get back your data, and it is not even guaranteed to get the data back if you follow them, that is where professionals come in, and trust me, sometimes it is better to get help than turning the problem into a bigger one.